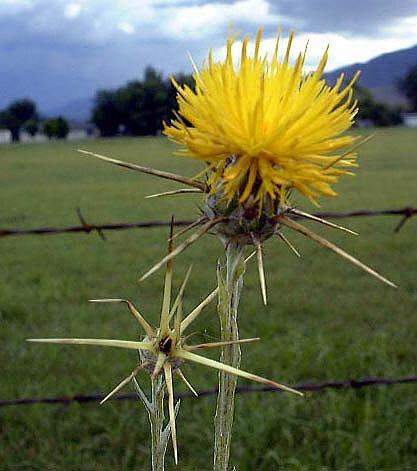 General Description:Yellow starthistle is an annual or biennial growing 20 to 80 cm tall (18 to 36 inches). Plants have deep taproots, winged stems and are covered in thin white, woolly hairs. Flower Description: Flowerheads with a wide base and composed of yellow flowers. Bracts at the base of flowerheads with spine tips of varying lengths. Larger spines on bract tips are 3/8 to 3/4 inch long (1.1 to 2.2 cm), yellowish in color and are star-like in arrangement. Leaf Description: Basal leaves lobed, sometimes with the terminal lobe larger and more rounded than the other lobes. Stem leaves smaller, becoming narrower and not lobed. Stem Description: Stems are dull green and covered with woolly hairs. Fruit/Seed Description: There are two types of seeds, both are 2 to 3 mm long and hairless. Outer seeds are dark brown and are without bristles (pappus). Inner seeds of seed head are glossy, white or light brown and mottled with short, white bristles (pappus) on one end. It is an aggressive species that has invaded millions of acres of rangelands in the western United States. Cattle feeding on it may be poorly nourished and can be damaged by the spiny heads. Horses may be poisoned and develop chewing disease.